To understand the lavishness of Sichuan food, you first have to understand Sichuan's geography. About three-fourths of the province is mountains, and the mountains that divide the lower elevations to the east and the Tibetan plateau to the west hold the richest temperate ecological habitats on earth. 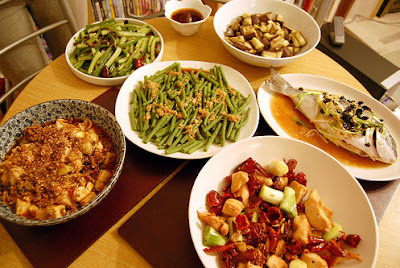 It is that abundance of species that has bequeathed Sichuan's food with copious variety. I reckon that Sichuan's cuisine makes use of more ingredients than any other cuisine in the world; I also think that the profusion of tastes and textures is the most extensive in the world. Generally speaking, Sichuan dishes are also oily and spicy. Representative of this is Spiced Fish Stew. Sometimes sauces are submerged in oil and this is due to a history of poverty. According to local wisdom, the deprived locals couldn't afford meats and as a result oil became a substitute for meats—that way, the oil gave vegetable dishes a rich texture and consistency, making up for absence of meat. This then led to another development: the imbibing of tea. Lets go on in the next post.